Toni Collette is interviewed on the set of "Enough Said". 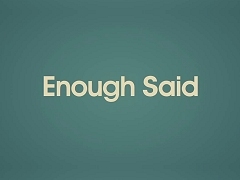 Selection of behind-the-scenes footage from the making of "Enough Said". Theatrical trailer for "Enough Said", directed by Nicole Holofcener and starring Julia Louis-Dreyfus and James Gandolfini.